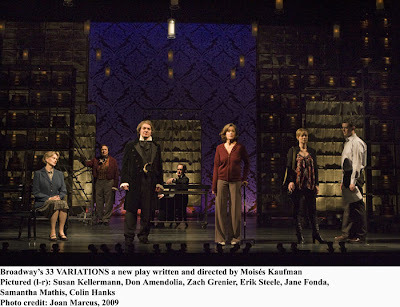 On the eve of May 16th I went to see 33 Variations , a play with music considering one of the main characters is Beethoven. 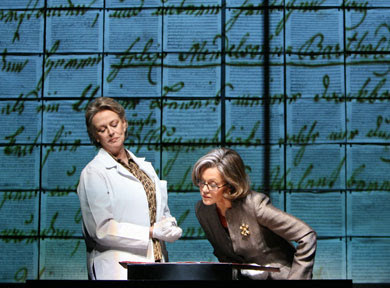 The play written by Moises Kaufman stars Jane Fonda as Dr. Katherine Brandt, a musicologist who tries to discover why Beethoven (Zach Grenier) spent 3 years of his life making 33 variations of a mediocre waltz initially composed by Anton Diabelli. It's set in present time and in the 1800's just around the time when Beethoven loses his hearing. It is a parallel story in which Beethoven struggles with debt, eviction and deafness with Dr. Brandt's struggle with her debilitating illness, Lou Gehrig's Disease. It also explores a prickly relationship between mother-daughter as well as how one handles the possibility of death and dying. It's a really good play with a good premise. Initially, Dr. Brandt surmises that Beethoven made the 33 variations to demonstrate that Diabelli made a mediocre waltz and he wanted to show that a great composer could make it a masterpiece. Through her research she gains friendship with another music scholar Dr. Gertrude Ladenburger (Susan Kellerman) and as her illness progresses she eventually also gains self-acceptance as well as closeness and understanding with her daughter, Clara (Samantha Mathis). It is actually her daughter, Clara who gives her the "light bulb" moment in understanding Beethoven's motives. Clara humms the Diabelli waltz one day and her mom asks her why she's humming it. She declares "because I like it. I think it's beautiful." At that moment, Dr. Brandt then realizes that Beethoven didn't find it mediocre at all but instead thought that it was beautiful. Simple but beautiful. So as he was losing his hearing, the waltz had spoken to him and he just wanted to stop time and capture every moment of the notes. Thus a 50 second piece developed into a 50 minute collection of music from Beethoven. Interesting premise isn't it? The play has a great cast of actors who were wonderful and so connected. But what's facinating in this show is the staging. The past and the present become interwoven. As Dr. Brandt studies the original charts of the variations, scenes of Beethoven struggling to write the variations come alive. A lot of the dialog is directed toward the audience and you feel like you were going on this journey to discovery with Dr. Brandt. The story telling is even enhanced by the presence of a grand piano with a classical pianist (Diane Walsh) located stage right. As a character talks about a segment of music or if they compare one variation to another, the pianist plays the music so the audience fully experiences it's beauty. There is this one powerful scene towards the end of the play when Beethoven finishes the last of the variation stands center stage and talks through how the peice should be played. He states out "start soft.......build up to a crescendo.......then fortissimo......." well, as he says this dialog, the pianist plays it as he directs it. It's intellectually stimulating as well as very pleasing aurally. The set (by Derek MacLane) is also very well thought of. As you can see from the next 2 pictures (taken from Theatremania.com) below, the stage is framed by archival shelves that slide in and out during scenes. Also, projections of the original music charts with Beethoven's writing are projected onstage. Even the erasures and corrections he made. It sort of showed you how the master was thinking or even struggling when he was composing them. It gives you an appreciation of how meticulous he is as a musician. I'm really glad I caught the show before it closed last Thursday. It was a really unique experience. Thanks for the wonderful review and photographs are FAB!